Super Hero Boy: Wearing the new baby.. the adventure continues. Wearing the new baby.. the adventure continues. I'm beyond excited to finally be getting all my baby carriers back out of the top of the closet. Though Connor is still technically in the weight limit to safely use many of our carriers these days he much prefers to walk than to be toted around by his mommy. I really miss the days of walking to the grocery store down the street with a precious little bundle on my back. Though what I miss most is how he would twirl his fingers in my hair as he started to drift off in his carrier. Connor's baby wearing adventure didn't start until he was six months old as we had several bad experiences with ill fitting carriers in the beginning and I still terribly regret that. This time I'll be ready and my baby wearing stash has greatly improved since Connors infant days. I've been asked very often what sort of carrier I recommend most... well that's really loaded question. What I recommend really depends on the age of the baby in question and what you expect out of your carrier. Though with all that said when it comes to newborns and the most comfortable of all carriers hands down a wrap is my favorite. 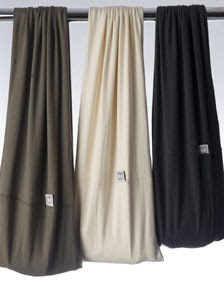 Something about the soft fabrics most wraps are made of is so comforting not to mention the fact that wraps are one size fits all so there is no need to buy a new wrap for different family members or if you loose or gain weight. With all that said one of my first experiences with baby wearing involved a wrap and the experience left me confused as its easy to get overwhelmed by the sheer amount of fabric involved in a wrap especially if your starting out your baby wearing experience without anyone to guide you. Speaking of the new baby I've been in baby overload lately looking for all the cool stuff we missed out on when Connor was an infant. I didn't get wise to natural toys until Connor was practically a toddler and we didn't try cloth diapers or baby carriers until pretty much his first birthday. Needless to say I plan on doing as much as I can with the new baby and earlier this year we were introduced to a great online store and resource, Parenting By Nature. Parenting By Nature is a Canadian based baby store specializing in natural baby products including baby carriers, cloth diapers, natural toys and even great products for moms and toddlers. They carry some of our absolute favorite baby items from baby legs to stainless steel water bottles, not to mention are a fabulous resource for baby carriers and cloth diapers. They also introduced us to a really unique baby carrier called the Blue Celery Sling. The Blue Celery Sling is sort of a weird hybrid between the super easy to use pouch sling and my beloved wraps. Pouch slings are usually my first recommendation to new baby wearers as long as you get the sizing right they are pretty easy to use and figure out even on your own. 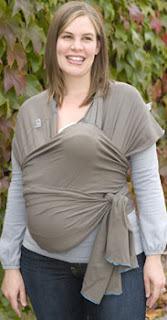 However many new moms complain about not feeling their baby is as secure which I've always found to be a non issue in a wrap. The Blue Celery Sling uses a ingenious system of two stretchy cloth pouches made of the same type of material as a wrap to really mimic the feel of a wrap without having to learn how to actually tie a wrap. You can use one pouch sling by itself with smaller babies as you would any other pouch sling or you can add the second pouch slung over the opposite shoulder to mimic the crossed over fabric that you get with a wrap. The sling comes with a third piece of material.. a long band that you wrap around the bottom of the sling just as you would the end of the fabric with a wrap, that allows for the two pouches to be used for older heavier babies or for more advanced holds. With the sash in place its almost impossible to tell that the Blue Celery Sling is a sling at all as with all three pieces in place it looks and acts like a wrap. Its really quite genius and allows for quite a bit of versatility over a standard wrap and much more versatility than a standard pouch sling. Really the only thing your loosing with the Blue Celery Sling over a wrap is the fact that this is not a one size fits all wrap. The Blue Celery Sling like any other pouch must be purchased to size. Though if your on a budget and you really are torn between a pouch sling and a wrap the Blue Celery Sling is by far the best option available that I've seen thus far. The fabric is super soft and slightly stretchy so its very easy to wear, machine washable, and the Blue Celery Sling comes in a assortment of gender neutral colors. Really honestly the only thing I would change is the color selection. Though I appreciate the neutral colors, I'd love to see it offered in some brighter colors. Visit Parenting By Nature to learn more about the Blue Celery Sling and to check out their great selection of baby carriers and infant gear! Look here now.We sell Supra Shoes in our Supra2you.com.We alsosale cheapest Nike Shoes like Air Max Shoes and Dunk sb Shoes in our two stores. Welcome you to order in our store, we will ship your order fee shipping.If you have intrest on our store,come on please.We also welcome you to visit our Blog about the Nike shoes. We wait you.